SAN DIEGO — For some, bobbing alone in the waters of the South Pacific without any contact to the outside world except the static and strange voices pulsing through a radio would be unnerving. But for 70-year-old circumnavigator Jeanne Socrates, it was nirvana. “It’s addicting, like being on top of a mountain with no one else around,” Socrates said. For many people, retirement means a time to slow down, take care of grandchildren or travel to the places they’ve never had time or money to see when they were working. Socrates, once a math teacher in her hometown of London, England, has spent much of her retirement time breaking records — the latest of which was becoming the oldest woman in the world to nonstop circumnavigate the globe, unassisted. “I actually calculated the total distance I’ve sailed just recently, and I found out that I’ve actually been around the world three and a half times now,” Socrates said. She was almost 50 when Socrates and her late husband, George, decided to learn how to sail. They took dinghy and windsurfing lessons in 1990. As they progressed in skill, the couple eventually sailed a competent crew course on the Solent. By 1997, the couple had acquired their first vessel, Nereida, which they sailed from Spain and Portugal, to the Caribbean and South America. 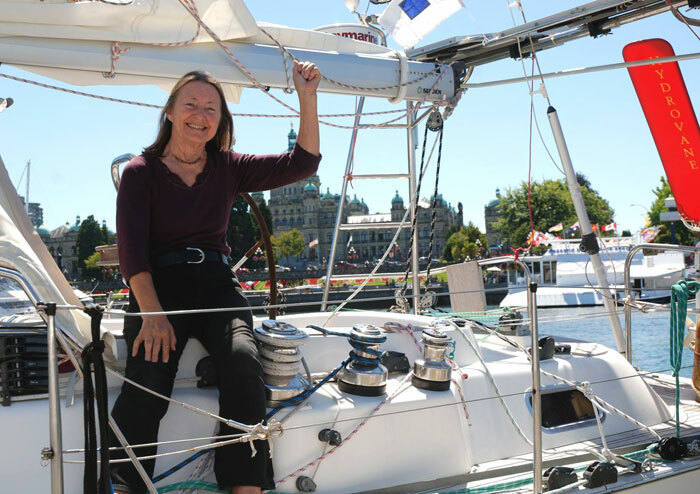 After her husband lost his battle with cancer in 2003, Socrates continued their sailing tradition, familiarizing herself with the various systems aboard Nereida before taking the vessel on her first solo nonstop circumnavigation attempt in 2007. She failed in that attempt, but traveling from country to country and enjoying the local color was her consolation. She’d try again in 2010. This time her consolation prize came with the title of oldest woman to circumnavigate the world. On Oct. 22, 2012, she made a third attempt. It was Day 190 of her 25,000-mile solo, nonstop circumnavigation when her computer, which she used to send emails and make daily updates to her blog — synereida.livejournal.com — went out of commission. This left the last 60-some-odd days of her 259-day voyage with only a radio to keep her company, make her whereabouts known and make her isolated existence manageable. “14300 is a particular frequency listening out for anyone, anywhere. I got to meet quite a few people there,” Socrates said. 14300 is the frequency of Pacific Seafarer’s Net, a safety system/organization that will take people’s positions and post them onto their website — pacseanet.com. It was there that Socrates met Tom Whiteside, or WAL6TLL as she knew him; Gil Grey, N2GG; Jim Brown, K9YC; Gary Robert Ham, WA6AMK; Rusty Epps, W60AT; Jim Miller, WB2REM; and Mark Magdaleno, N6MJC. People were so inclined to listen to her story, they even helped her continue her blogs and to send emails by transcribing her words over radio. “In the end, I had a thousand emails relayed in only those few months,” Socrates said. When she arrived in Victoria, British Columbia — becoming the oldest woman to nonstop solo circumnavigate the globe — Socrates decided to pay some visits, putting faces to the names of many of the people who had helped her via radio, during the last few months of her journey. “Jim, Gary and Rusty came by in San Francisco to see me,” she recalled. While there, Socrates also met with several members and admirers from Cruising Club of America, which announced to the circumnavigator that they will be awarding her the Blue Water Medal in New York, next March. After San Francisco, Socrates sailed to Santa Cruz, where her radio malfunctioned. Brown (K9YC) met her, again, to help fix the device, and he treated her to dinner with his wife. The sailor then made her way farther south to Newport Beach, where she was set on finally meeting Seafarer’s Net operator Tom Whiteside (WA6TLL). “Tom will be turning 90 years old, and I was determined to see him,” she said. Whiteside, from Riverside, hitched a ride with his daughter Judy to Newport Beach, where he and Socrates shared a drink and had dinner. Currently, Socrates is docked in San Diego, where she’ll do some repair to her Nereida before heading back out to sea. Lots of bolts and screws came loose while on her voyage, so she’ll need to replace several small items. Nereida will also need a new wind generator. The boat’s last one “jumped” off its pole south west of Tasmania due to stormy seas. The dinghy and outboard need servicing, broken impeller bits need to be removed from the boat’s engine heat exchanger, and Socrates will have to climb the mast to undo several tangled lines. After she finishes all that, don’t count on her to stay on shore too much longer.